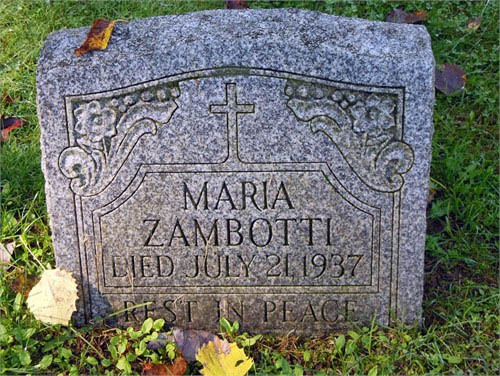 July 21, 1937: Mrs. Marie Zambotti, of Weston, PA, wife of Peter Zambotti, died Wednesday at her home following a four weeks’ illness. She is survived by her husband, three brothers, Dominic Genetti of Italy; Ralph Genetti of Weston; Joseph Genetti of California and one sister, Mrs. Erminia Recla of Spokane, Washington. The funeral will be held Saturday morning at 9 o’clock with a requiem high mass in the Sacred Heart church at Weston at 9:30 with Rev. J.C. Ward officiating. Interment will follow in the parish cemetery. Burial: Sacred Heart Cemetery, Weston, Pennsylvania.